My personal favorite documentary of the last few years is the King of Kong. Drama, video games, arcades, and molestor mustaches---a proven recipe for a good time. I had read a little bit about Grizzly Man, and was fairly excited to see it. Let me tease it thus: Man lives among grizzly bears...carnage and death are caught on camera(kind of)...voice-overs reminiscent of Arnold Schwarznegger in Conan the Barbarian. Sounds like a barn-burner right? Wrong. The documentary follows the story of Timothy Treadwell, a man who lived among the grizzly bears in Alaska for many years. He filmed many hours of his experience, and ended up being killed by a bear in 2003. The movie tries to paint a picture about why he lived among the bears, and his mental state regarding his situation. Treadwell is kind of mix of Richard Simmons, Patrick Swayze, Bear Grylls, and Captain Kangaroo. SPOILER ALERT----Whoops. The paragraph above is a spoiler. A dude who lived with grizzly bears died. Didn't see that one coming. Werner Herzog is the film-maker, and is actually quite good....just not in this flic. He is constantly giving his personal opinions during the movie. He voices over at just about every slight break in the film. His voice is a dead ringer for Conan the Barbarian, and I was waiting for him to say "It's not a tumor" at the drop of a hat. I personally don't care what some random German thinks about a dude living with bears. Let me see the tape, and I'll make up my own mind what kind of person Treadwell is. Herzog also scored a gigantic FAIL in his choice for interviews. The interviews felt so forced and prepared. I literally thought I was watching an episode of Reno 911 at times. Add this to the fact that a few of the interviews were with actual lunatics. A local pilot and the coroner were especially funny. They describe events like a Grandpa telling a story around the campfire. How the film-maker kept a straight face during these moments seems impossible. A particular interview shows the coroner giving Treadwell's ex the watch he was wearing when he died. The exchange was set up just for the movie, and is ridiculous. The coroner slowly cuts open the evidence bag and hands the ex the watch. She mentions how it is still running, and then tears flow while creepy coroner dude tries to force conversation. It is ridiculous. I half expected David Caruso to enter stage right, and say "Treadwell took a licking, but couldn't keep ticking," followed by the Who breaking in with a theme song. Actual film clips from Timothy Treadwell were actually quite interesting. His personality and video was far more insightful than other clips of interviews and monologue by the film-maker. His interactions with the animals make for real drama. They discuss his death in the first 10 minutes of the show, ruining any sort of suspense as to his mindset or situation leading up to the event. In fact, the whole story would have been better suited as an A&E 30 minute special rather than a 90 minute film. In fact, I believe there is such interest in his story mainly BECAUSE of his death. If he were still visiting the bears during the summer, his reality show would air sometime after Survivorman, and before Mantracker. This current season would probably have Snooki living just up the valley from his tent. This movie felt like a distant cousin of Into the Wild. I suggest the latter, as it is a much more interesting picture. Obviously I in the minority with my irritation and dislike of this movie. It garners a 93% rating on rotten tomatoes, and is considered to be one of the best documentaries of the last decade. I'm also late with the review as the movie came out many years ago. Let's just say the stars aligned, and my free preview of the Sundance channel accomodated this review. I give the movie 2 stars, solely for the footage shot by Treadwell himself. It was far more engaging than the rest of the movie, which I call Conan the Snoozebarian. I've been meaning to get this one, because it looked so good, but now I think I'll give it a pass, based on your review. If I might, a documentary you might enjoy is Man on a Wire. Well, even if I might not, I already did. Keep the reviews coming here. Loved the Inception review as well, as it was "dead on." Yes, the inception review was really quite good. Man on Wire is a great documentary. Haven't seen Grizzly Man yet, but some other good ones are Wordplay, Mad Hot Ballroom, and Spellbound. 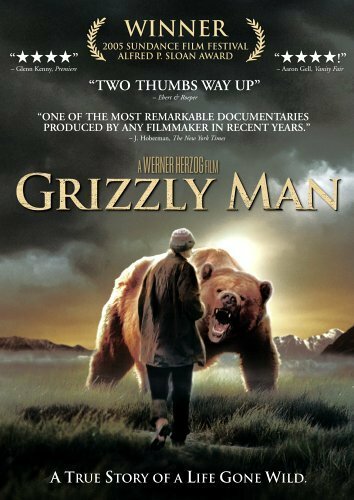 Rambler--You should probably watch Grizzly Man. As I mentioned, it was almost unanimously praised. I'm just contrary by nature. Come back again...haven't seen you around for a while.